As it turns out, the on-going sanctions against Russia by the US and the eurozone might actually be good for the economy, Russian President Vladimir Putin told the German TV news station ARD. “True, there are pluses because, let’s say, those restrictions on the acquisition of certain goods in the West, in Europe, in the States are introduced for some Russian companies — this forces us to produce that good ourselves,” Putin told ARD. “This comfortable life where we thought only about producing more oil and gas, and buying everything else, is in the past,” he added. In other words, Putin stated that the sanctions will force the Russian economy to evolve past its dependence on the oil and gas industries. The Russian economy has taken a serious beating following the sanctions. For starters, the ruble is now in free fall and inflation is way above target. Additionally, falling oil prices have put immense pressure on the economy. Despite the economic turmoil, Putin told ARD that the Russian economy is still growing. “Regarding growth. This year we saw a modest growth, but it was still growth — somewhere between 0.5 to 0.6 per cent. Next year, we plan to grow by 1.2 per cent, and then — 2.3 per cent the next year — 3 per cent growth. 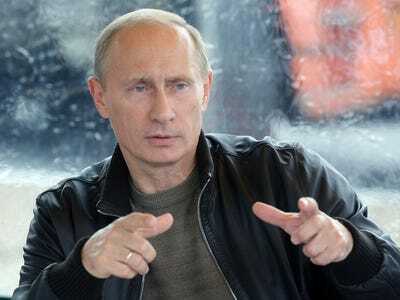 In general, these aren’t the numbers we would like to see, but it’s still growth, and we’re confident that we will achieve these targets,” Putin said.